I often feel sorry for Roo and Tigger as I drag them out to complete the weekly food shop or if I have to pop into town to run errands or grab a few odds and ends. As a busy mum I often don’t have the time to stop and look at all the pretty things that interest Roo, so when Claire’s asked me if I’d like to treat Roo and one of her friends to a girlie shopping trip I knew this might just make up for all the dashing about I have been doing recently. So after sneakily exchanging text messages with her best friend Niamh’s mum I arranged to pick the girls up on Sunday morning and head of into town to do a little Christmas shopping. Once in the car park I let them in on what I had planned for them, big hugs and cheers for me (yay!). 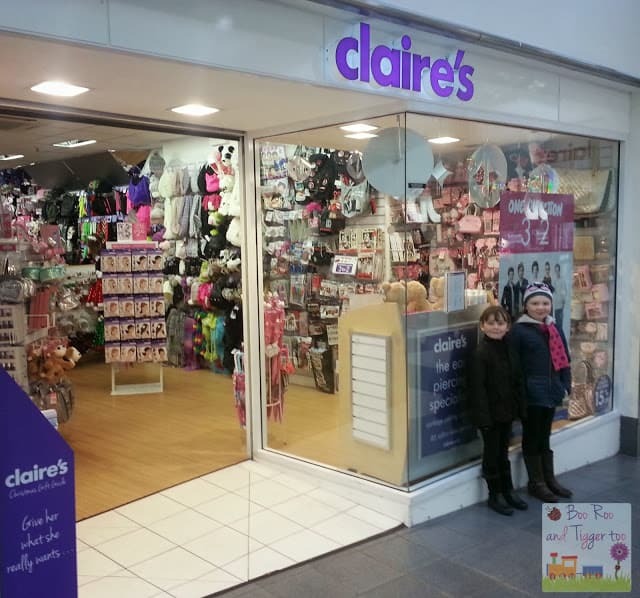 Armed with £40 in gift vouchers each we headed off into our local Claire’s store in the Market Gates, Great Yarmouth. I handed them each a shopping basket and started to look around the store. 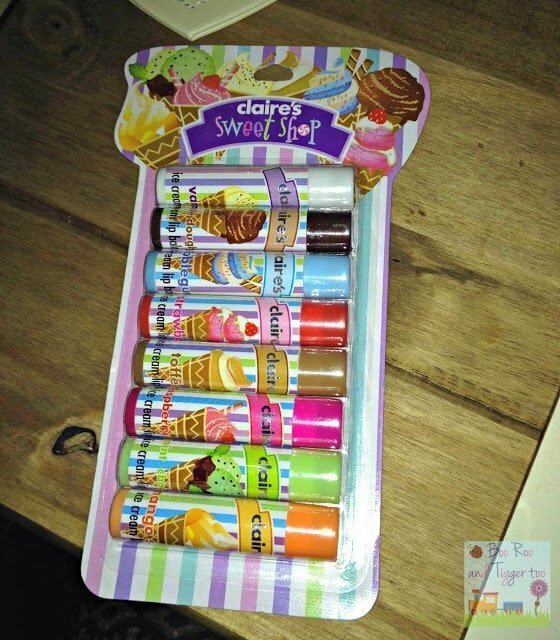 Niamh had already mentioned that she wanted to get a multipack of ice cream flaboured lip balms so we decided to find them first. A great 3 for 2 offer is running at the moment on character products so I carefully explained to the girls that they could chose 3 items but only be charged for 2. 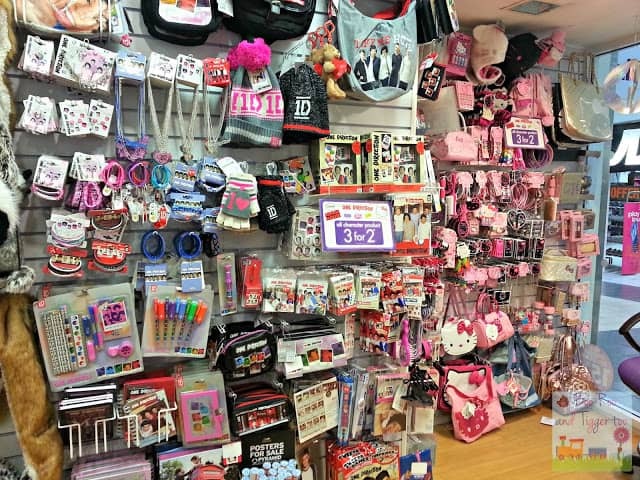 As the Hello Kitty and One Direction range was included in the offer you can just imagine how long we spent looking through all the items available. Roo being frugal opted to chose several items from the offer, bagging herself a new Hello Kitty purse and bag, a One Direction notebook amongst other bits and bobs. Niamh opted for a fabulous leopard print bag (hopefully her Mummy won’t pinch it), a One Direction pocket mirror and what I thought was so sweet she bought her step sister a little something too so that she didn’t miss out (bless her). After grabbing all that they wanted we headed off to the till where they items where placed in their own shopping bags and luckily we managed to come just under budget by 50p. With all that shopping it was time to head and grab some lunch, investigate what each of them had bought before heading off to the Time and Tide museum for a Christmas activity. Thank you Claire’s we had a fabulous shopping trip! Disclosure Policy: We received £80 Claire’s Gift Vouchers FOC for the purpose of the shopping trip and to share our experiences. Previous Post: « DVD: Thomas & Friends – Merry Christmas Thomas!